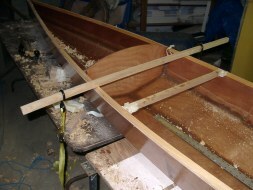 With the hull fiberglassing finished, it was time to start thinking about applying the deck. 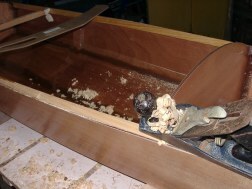 Before I could do that though I had to plane down the sheer clamps. You may remember from "Gluing the Sheer Clamps" that I left a 1/4 inch hanging over the edge at the top edge of the side panels. 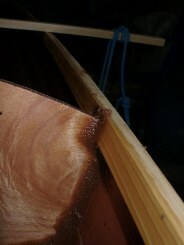 In the next step, I used a block plane to get the sheer clamp to the correct angle though out the length of the boat so that the deck would rest nicely on top of it. In the before picture (on the left) the sheer clamp is not at all beveled and is protruding a 1/4 inch above the top edge of the bulkhead. 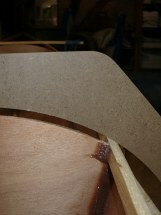 In the after shot the sheer clamp has been planed down to the height of the top edge of the bulkhead and is beveled to the same curve as the bulkhead. 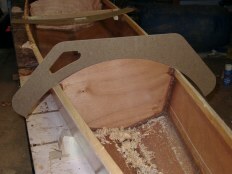 Forward of the cockpit, the cross-section of the deck follows an arc with a 16" radius. Aft (behind) the cockpit, the curve was more flattened with a 24" radius arc. 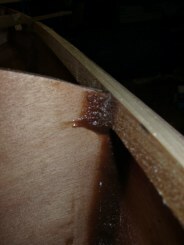 You can see in the pictures above that the recently planed sheer clamps now follow the curve of the bulkhead. This step was definitely the most technically challenging so far but I think I got it to match the template fairly well.